In this lesson, I’m going to teach you eight guitar chords you must know if you’re a guitar player. 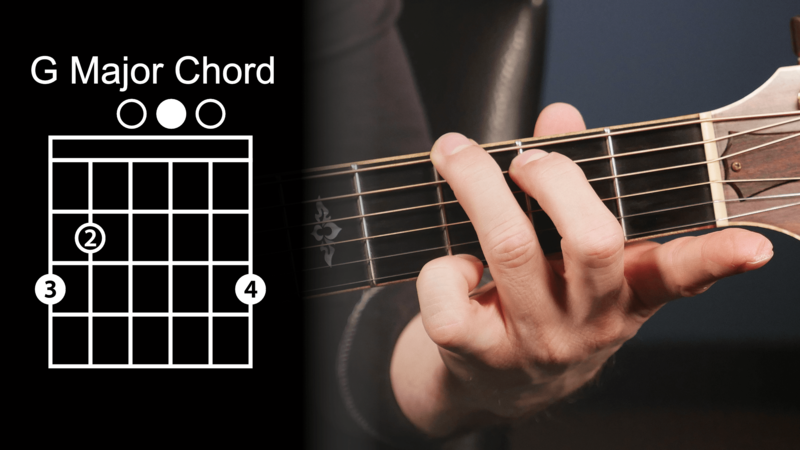 Even if you already know these chords, you can still stick around since I’ll be giving you some tips to make your chords sound clean and your transitions sound smooth. If you want to learn to use these chords to play popular songs, check out these guitar lessons for beginners. The eight chords we’re going to look at in this lesson are G major, C major, D major, F major, E major, A major, E minor, and A minor. Now, you might be thinking that there’s no way you can remember these chords in one lesson, but don’t worry about that. You can space these out over a few weeks or a few months and take them on at your own pace. 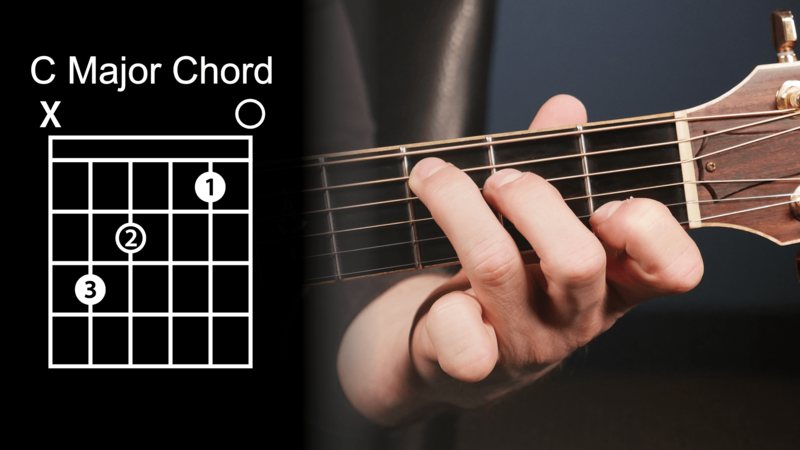 Chord Tip: Bring your hand up to the guitar and pretend you’re holding something shaped like an apple, which helps you with your posture when making chords. Put your thumb on the back of the guitar, and make sure to relax and release any extra tension you may have. 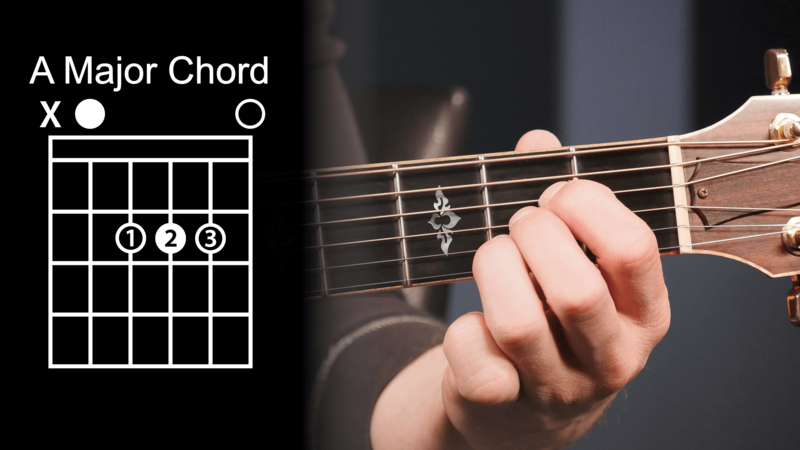 G Major Chord: When you’re making the G major chord, you can use your first, second, and third fingers, or you can use your second, third, and fourth fingers. I encourage you to start with your second, third, and fourth fingers, and I’ll show you why in a bit. Try it, and if you find it’s too hard for you now, you can always switch. Put your third finger on the third fret of the low E string, and be sure to come down on the very tip of your finger. Don’t let your fingers get lazy and accidentally brush against any other strings. You also want to make sure that your fingers are placed right behind the fret. For the second note of the G major chord, place your second finger on the second fret of the A string. To finish the chord, place your fourth finger on the third fret of the high E string, and then strum all six strings. If this is feeling uncomfortable, you can make this shape with your first, second, and third fingers, but I really encourage you to use your second, third, and fourth fingers if you can. C Major Chord: Let’s move on to the C major chord. Place your third finger on the third fret of the A string, your second finger on the second fret of the D string, and your first finger on the first fret of the B string. When you strum, leave the low E string out and just strum the top five strings. Chord Tip: If it’s buzzing or sounds muted, check that your fingers are coming right down on the strings. The C major chord will always be a good way to check if you’re on the tips of your fingers enough. D Major Chord: The next chord we’ll look at is the D major. Put your first finger on the second fret of the G string, your third finger on the third fret of the B string, and your second finger on the second fret of the high E string. When you strum, leave the low E and A out, and just strum the top four strings. 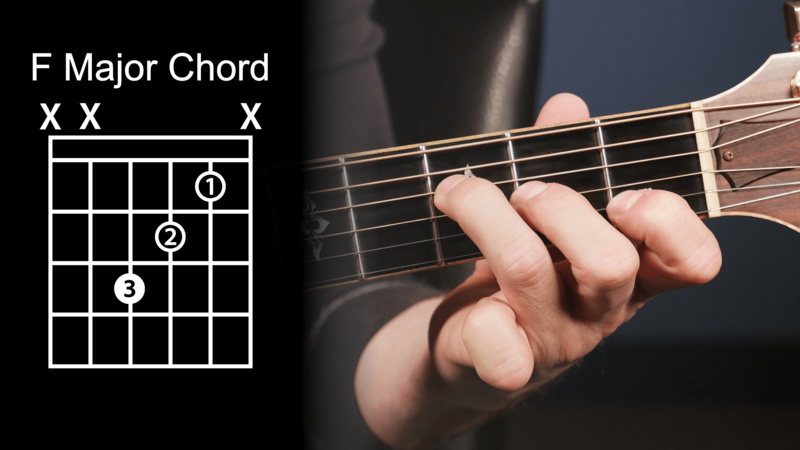 Chord Tip: When it comes to memorizing guitar chord shapes, there are two things you can do to help you memorize chord shapes faster. The first one is to look at the chord when you make it and memorize what it looks like. 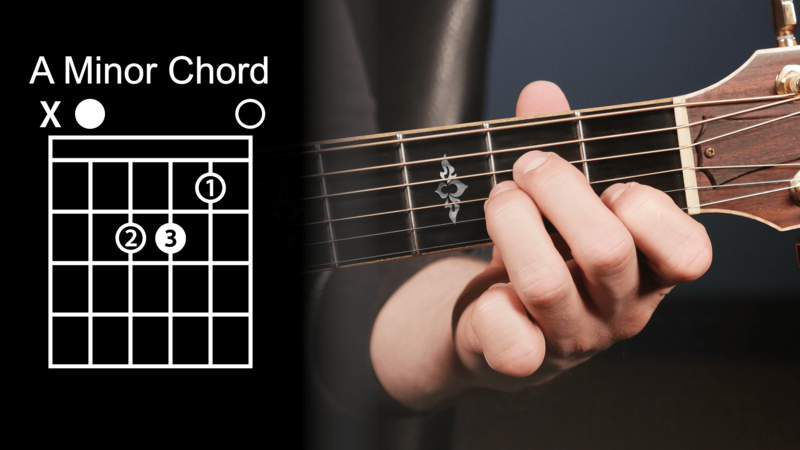 You’ll probably be looking at the chord shape diagrams on paper or on the computer, but looking at the chord shape as you make it is a great way to help remember it. The second tip is to memorize how the chord shape feels. Look away from the chord shape and think about how the shape feels. If you try to memorize the chord shapes in a few different ways, you’ll have a better chance at remembering them. F Major Chord: Now let’s look at an F major chord. Some people are scared of the F major chord because many beginners learn it as a bar chord. The F major chord you’ll learn today is much easier because it is only a three-note chord. Place your third finger on the third fret of the D string, second finger on the second fret of the G string, and first finger on the first fret of the B string. When you strum, just hit those three strings. E Major Chord: Next I’ll show you an E major chord. Place your second finger on the second fret of the A string, third finger on the second fret of the D string, and first finger on the first fret of the G string. Remember to come right down on the tips of your fingers and as close behind the frets as you can. For this chord, strum all six strings. A Major Chord: Let’s work on an A major chord next. Put your first finger on the second fret of the D string, your second finger on the second fret of the G string, and your third finger on the second fret of the B string. 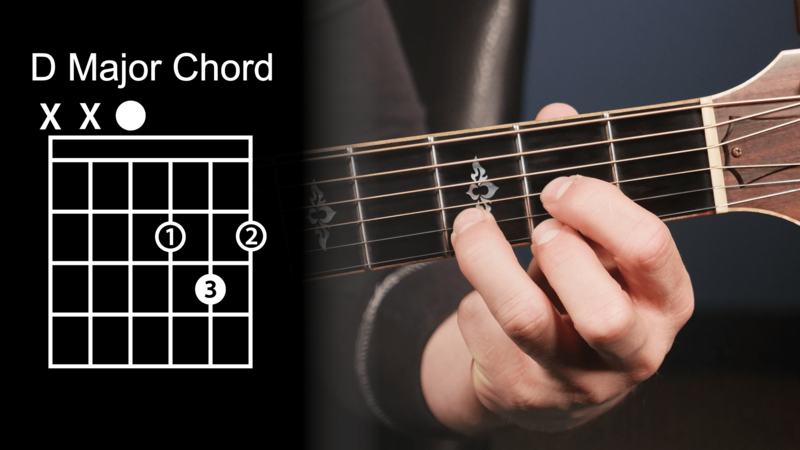 This chord might be challenging because you have to place your fingers in a small area on the second fret. When you strum this chord, leave the low E string out and strum just the top five strings. 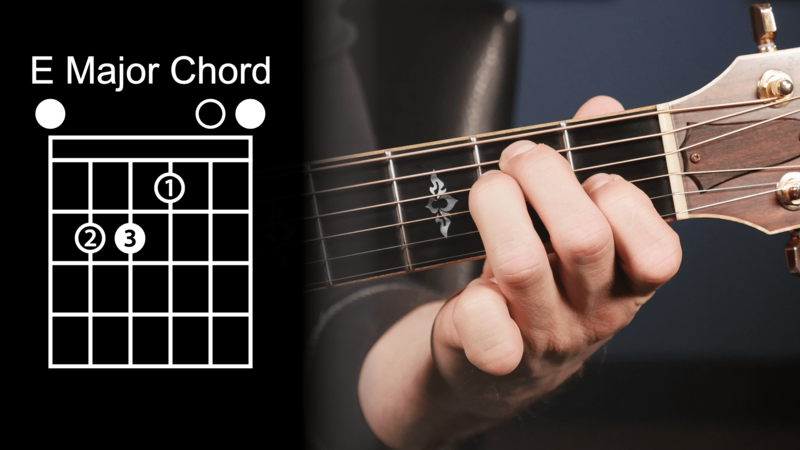 Chord Tip: You’ll notice that we’re breaking a rule here because our first and second fingers aren’t right behind the fret, but that can’t really be helped in this chord shape. To help you learn this chord, try making the shape for thirty seconds, shaking it out, and trying that a few times. Once you have this chord down solid, you can try switching between the A major and E major. E Minor Chord: Start with the E minor chord by making the E major chord shape, and then simply take your index finger off. That’s all you have to do to make your E minor chord. A Minor Chord: The last chord we’ll look at is an A minor, and this one is neat because it feels like an E major chord that’s just been moved over a string set. Place your second finger on the second fret of D string, third finger on the second fret of the G string, and first finger on the first fret of the B string. Strum the top five strings, leaving the low E string out. 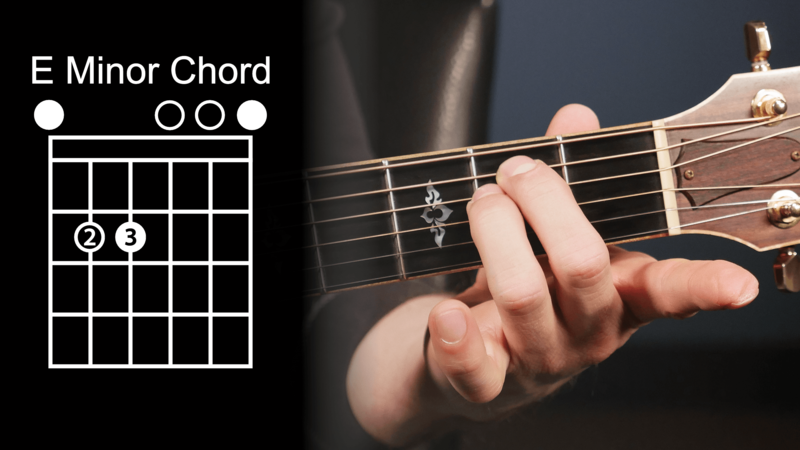 Now you can see how this chord shape looks just like the E major shape, but on different strings. Bar Chords & Power Chords: Open chords are some of the most important chords you’ll learn as a guitarist. While bar chords and power chords are important too, it’s these open chords that are your moneymakers. As you work on each of these chords, remember to apply all the tips I gave you about making clean sounding chords and smooth transitions. If you want to learn more about the most important rhythm guitar techniques check out the Rhythm Guitar Quick-Start Series.